If you’ve ever taken a ride in an Uber or Lyft, chances are you saw that the car you were riding in had stickers for both companies. For the driver, it makes sense to have access to two streams of income and tap into the one which is flowing best on a day to day basis. 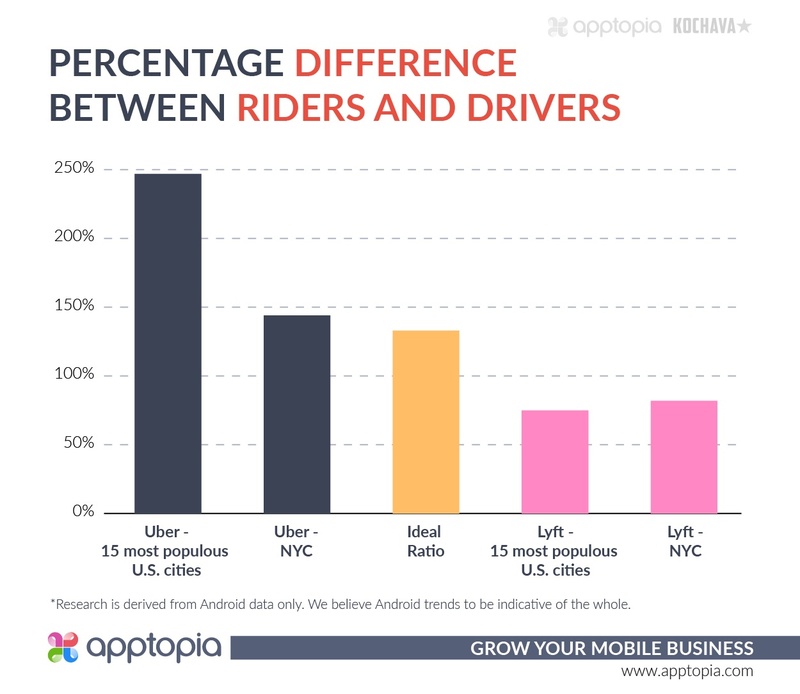 According to Apptopia's cross app usage estimates, about 85% of Uber/Lyft drivers in America drive for both companies. Given the large overlap, we wanted to determine which app drivers are spending more time in every day. The average user has the Lyft Driver app open and running for 50.1 minutes/day while the average user for Uber Driver opens and uses the app for 72.3 minutes/day. This equates to 5.8 hours/week and 8.4 hours/week respectively. Keep in mind this data has nothing to do with the number of U.S. cities either company operates in, it only reflects average time of use. There is a 44.8% difference between the two. 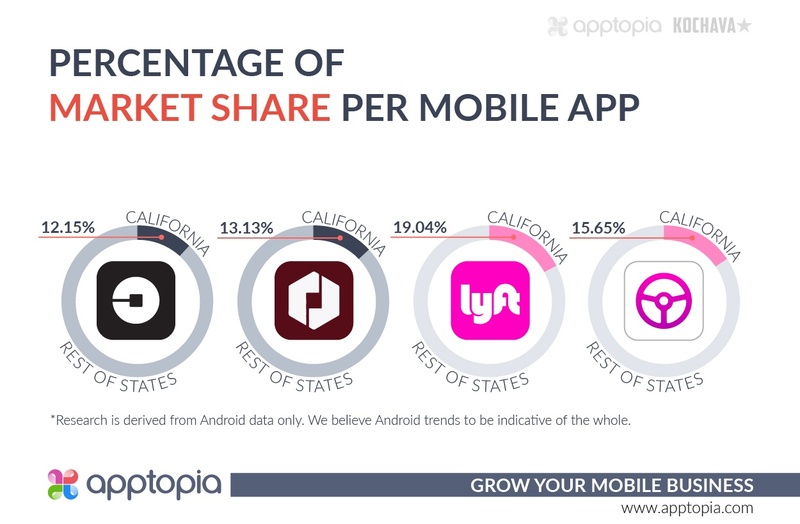 We believe this is due to demand from consumers, because when we look at average daily active users of the rider (consumer) apps in the U.S., Uber has 45.8% more average daily active users than Lyft. *The following research is derived from Android data only. We believe Android trends to be indicative of the whole. California holds the largest percentage of riders and drivers for both Uber and Lyft. The state is known for being friendly to progressive tech, and both companies are headquartered there as well. When looking at the pie charts below, remember this is the state as a whole and not city-specific. Getting more granular, we studied the 15 biggest cities in the United States by population. [NYC, LA, Chicago, Houston, Phoenix, Philadelphia, San Antonio, San Diego, Dallas, San Jose, Austin, Jacksonville, Fort Worth, San Francisco, Columbus] It’s a healthy business model to have more riders than drivers in a given city, as one driver can carry many riders throughout the day, or even at the same time with the Pool/Line functions. 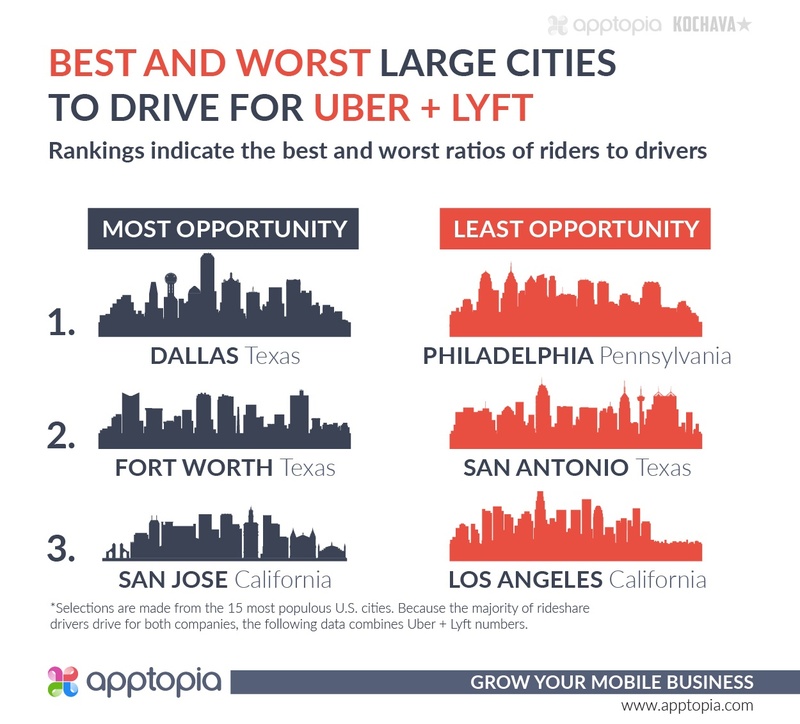 The percentage difference between riders and drivers for Uber across these 15 most populous cities is substantially greater than it is for Lyft. On average, Uber has 247% more riders than drivers across these cities while Lyft has 75% more riders than drivers. It’s possible a greater percentage of big city Uber riders use Uber Pool more than big city Lyft riders use Lyft Line. However, it’s more likely Uber has done a great job of attracting riders, so much so that it is struggling to have enough drivers. This drives up prices for riders, but it also leaves money on the table for Uber. A recent article from the New York Times cites data from RideAustin that says the ideal ratio is “about 30 drivers for every 100 trip requests.” If we agree that trip requests loosely means riders, this means there should be about 133% more riders than drivers - a number somewhat in between the two averages across the 15 most populous U.S. cities. New York City officials recently decided to halt new rideshare cars entering the market. Uber and Lyft have argued against this, saying they are not flooding the roads with cars as that would not be good for their business. They are simply trying to keep up with demand. Looking at the data, Uber will be hurt by the cap more than Lyft. Uber has 144% more riders than drivers in NYC while Lyft has 82% more. If we’re to believe the 133% number from above, Lyft doesn’t need more cars in the market but Uber could potentially benefit. This takes into account simple supply and demand rules. There is ample opportunity for rideshare drivers in cities where there are plenty of riders and not enough drivers. Likewise, some cities are far too saturated and potential new rideshare drivers should consider another source of income if possible. This does not take local gas prices or any other factors into consideration. A big shout out and thank you to our friends at Kochava for their help in compiling this research.